Shopping for a new washer and dryer is a bit more complicated than it once was because manufacturers update their products a lot more often. 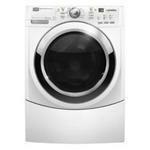 There are new washers and dryers hitting the market almost as often as there are new smartphones and flat-screen TVs. The analogy is not all that far-fetched. Washers and dryers aren't the clunky old appliances of yesteryear but today are driven by technology and sophisticated electronics. Today, most consumers shop for these appliances at big box stores – home improvement centers like Lowes and Home Depot and electronics chains like Best Buy and HHGregg. Just as each generation of smartphone has new capabilities, appliance manufacturers are also constantly adding new features. Since the last time you bought a washing machine, for example, manufacturers have added heat and steam functions to washers to remove dust mites and pet dander. The new machines are also quieter. Many use advanced sound-reducing material to dampen the noise. Some have a feature to reduce the vibration during the spin cycle. Have you ever washed a load of clothes and forgotten about it until several hours later? 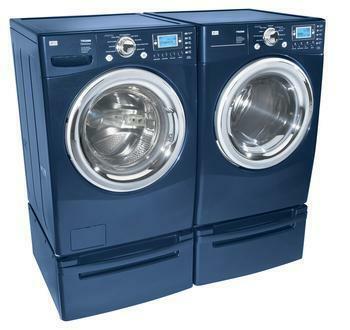 Some new washers take that into consideration, venting in fresh air and occasionally tumbling the clothes to prevent the kind of odors that can develop when wet clothes sit for hours. Over the last few years many washer manufacturers have added steam capability that can help root out tough stains. Some use oxygen-based cleaners to brighten clothes without bleach. Dryers have also added features, including sensors to automatically shut down when the clothes are dry. That helps prevent over-drying and shrinkage and can extend the life of the fabric. Sometimes you don't really need to wash an item of clothing, you just need to freshen it up a bit. Some dryers come with a steam feature that allows you to relax wrinkles and remove odors, saving a rewash. Need to dry something in a hurry? You can if your new dryer has an express cycle that uses a large blower to increase the airflow, drying the clothing faster. 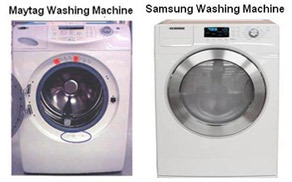 These features appear on a wide array of washers and dryers from major manufacturers. Among the largest companies making these appliances are GE, LG, Whirlpool,Samsung, Electrolux, Frigidaire, Bosch, and Maytag. It's a good idea to read consumer reviews for all the brands you're considering because, in the past at least, some models have drawn a large number of complaints. In 2005 Maytag settled a class action suit over its Neptune washers. According to documents filed in a suit heard in Illinois, many Maytag consumers complained of their machine functioning improperly and clothing being covered in mold, as a result of problems with the door latch, wax motor, motor control, and related circuit boards. There are still complaints about Maytag and other brands. Donna, of Molino, Fla., writes in a ConsumerAffairs posting that she had a problem with her three-year-old Maytag Legacy and called her repairman, whom she knew to be very honest. Veronica, of Calgary, Alberta, had problems with her new Samsung washer. Veronica notes that when she called Lowes, where she bought to machine, to complain a customer service rep told her she needed to learn how to properly operate the appliance. That could well be an issue with a number of problems consumers report with their new washers and dryers. These machines are a lot more sophisticated than previous models and may, in fact, be harder to properly operate. Both Donna and Veronica wished they had their old washers and dryers back and there might be a lesson there. Considering what a new washer-dryer combo costs these days, if you are in the market for laundry appliances, perhaps picking up good used washers and dryers, at a fraction of the price and much simpler to operate, could fill your needs. "I have been a loyal customer in the past with Maytag because their products lasted forever," Carol, of Smyrna, Ga., told ConsumerAffairs.com. "However, I purchased a Maytag dryer in 2005 and the control board has gone out twice since then, costing me $270 for the first visit to have it repaired." Carol thinks Maytag's product and service has "gone down the tubes," as she puts it, and she isn't alone. Laurie, of Port Saint Lucia, Fla., says she purchase a 5.0 cubic foot Maytag Bravos washer in January and is less than satisfied with the results. "The machine tangles clothing into such a mess everything has to be put in the dryer prior to hanging up to dry," she said. "Even with the use of pre-treatment many stains remain on our clothing and there are pin holes in cotton garments. This washer is now leaving what appears to be streaks of rust on our clothing." Tracey of Henderson, Nev., said she did extensive online research last summer before selecting a Maytag Bravos. She saw plenty of reviews from people who were happy with the machine, but also from consumers like Laurie. "I guess I should have given more weight to the individuals who indicated issues with the product," Tracey said. "Because the majority of the reviews were positive or mostly positive, I went with this product. However, some of the reviews I read indicated that the washer was rough on clothes (I agree) and that the washer balled up the clothes into tight wads producing many wrinkles (it does). Some of the reviews also indicated that the dryer takes a long time to dry (it does) and that it does not get out the wrinkles that the washer causes." Tracey said she wishes she could get her old washer and dryer back, even if they were less energy and water efficient. Ryan, of Bullard, Tex., thinks new efficiency standards are why washing machines in general are giving consumers so much grief. "Washing machines built these days, which have to live up to governmental restrictions on water usage, aren't worth the price you could get for scrap metal for them," Ryan told ConsumerAffairs.com. "I've owned a Maytag front loader for five years and spent more than it is worth to fix it on multiple occasions. There is no way any modern day washing machine will ever work as well as older units because of governmental water restriction laws." 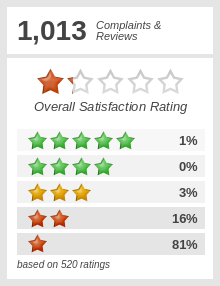 Consumers also seem to have some issues with Maytag refrigerators. Kenneth of Katy, Tex., said he bought a Maytag French Door Refrigerator from Home Depot a little over four years ago. "About five months ago it started making a humming noise off and on, then the temperature started rising and everything was thawing out," Kenneth told ConsumerAffairs.com. Multiple service calls failed to locate the problem, though technicians ruled out a faulty compressor, saying a relay might be at fault. "Finally we were advised that it might be a fire hazard so we are leaving it unplugged," Kenneth said. Interestingly, Maytag recalled 1.6 million refrigerators in 2009 because of an electrical failure in the relay that turns the compressor on and off. The failure can cause overheating and pose a fire hazard. A year later, the Consumer Product Safety Commission announced the recall of 1.7 million Maytag dishwashers, saying an electrical failure in the dishwasher's heating element could pose a fire hazard. Like many U.S. manufacturers, Maytag in recent years has closed some of its American plants and shifted operations to Mexico. However, the company still operates a significant number of U.S. manufacturing plants. Regardless of the source of the problems, consumers seem increasingly frustrated that appliances that once worked extremely well in the past, don't always seem to now. "My husband and I purchased a Maytag Neptune washer and dryer in Oct. 2005," Mary, of Highland, Ind., told ConsumerAffairs.com. "The washing machine is shot. The repairman told us that the bearing assembly and seal, along with the stabilizer for the drum, needs to be replaced. The repairs would cost more than the $700 we spent on the washer. I spoke with Maytag, all they could do was offer an apology." Maytag has settled a consumer class action suit alleging odor, mold and mildew problems with Maytag Neptune Washers. More than two million consumers are included in the class, and may receive repair reimbursements, replacement costs up to $500, and/or washing machine purchase certificates up to $1000. Whirlpool Corp. has won approval of its $1.79 billion purchase of Maytag Corp. The Justice Department today agreed the merger would not significantly reduce competition. Canadian authorities approved the merger March 14. "We are pleased with the decision ... that the global home-appliance industry is open and competitive," said Jeff M. Fettig, Whirlpools chairman and CEO. "This transaction will result in better products, quality and service, as well as cost efficiencies, which will enhance our ability to succeed in the competitive global home-appliance industry. Consumers will benefit from a combined Whirlpool and Maytag business." The Justice Department said that although the combined company will be producing half of the dishwashers in the United States, an investigation by its Antitrust Division found that at least five other companies are well established in the U.S., thus making it unlikely the merged company would be able to drastically raise prices. The combined entity is expected to control more than 70 percent of the clothes washers and dryers. Whirlpool is the largest appliance manufacturer in the U.S. Maytag is number three, behind GE Consumer products. Whirlpool had agreed not to complete the transaction until March 30, to give the Justice Department time to review the deal. Maytag has announced a massive recall of 1.6 million fire-prone refrigerators. The recall includes Maytag, Jenn-Air, Amana, Admiral, Magic Chef, Performa by Maytag and Crosley brand refrigerators. Maytag is recalling about 5,000 front-loading washing machines. If the front-load washer is operated at maximum load capacity, the spinner could malfunction and break apart, posing a safety risk to consumers. 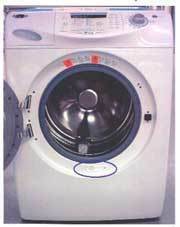 The recall involves white Maytag front-load washers with model number MAH9700 and a serial number from 10188468GA through 11683946GJ. The model and serial numbers are located inside the door opening and below the rubber boot. The units were sold at major department and appliance stores nationwide from April 2005 through May 2005 for about $1,300. Consumers should use care not to exceed the listed capacity of their machines, and should contact Maytag for a free in-home service call to replace the washer's control board. Consumer Contact: Consumers can contact Maytag at (800) 462-9267 anytime, or visit the companys Web site at www.maytag.com. September 27, 2005 Maytag is recalling about 5,000 front-loading washing machines. If the front-load washer is operated at maximum load capacity, the spinner could malfunction and break apart, posing a safety risk to consumers. 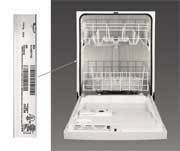 February 25, 2005 About 162,000 Whirlpool and Kenmore dishwashers are being recalled. An electrical defect in the motor wiring poses a risk of the motor overheating and possibly catching fire. The U.S. Consumer Product Safety Commission has announced a recall of about 270,000 Maytag and Samsung front-loading washing machines because of a fire hazard. Water leakage onto the electrical connections to the washing machine's thermal sensor could cause an electrical short and ignite a circuit board, the agency said. The machines were sold by major department and appliance stores nationwide from April 2005 through August 2006 for between $1,000 and $1,200. Consumers should immediately contact the firm for information on how to receive a free repair. Consumers should not return the washing machine to the retailer where it was purchased. March 21, 2007 The U.S. Consumer Product Safety Commission has announced a recall of about 270,000 Maytag and Samsung front-loading washing machines because of a fire hazard. Maytag is recalling about 2.3 million Maytag and Jenn-Air brand dishwashers because of a fire hazard. Liquid rinse-aid can leak from its dispenser and come into contact with the dishwasher's internal wiring which can short-circuit and ignite, posing a fire hazard, the company said. Maytag has received 135 reports of dishwasher fires, resulting in product and/or property damage. Four injuries have been reported, including three reports of smoke inhalation and one serious hand laceration when operating a fire extinguisher to put out a fire in the dishwasher. The recall involves Maytag and Jenn-Air under counter or portable plastic tub dishwashers. The dishwashers have black, white, almond, bisque and stainless steel front panels. The following model and serial numbers are printed on a label located on the dishwasher's plastic frame on top of or to the left of the door opening. Consumers should contact Maytag to determine if their dishwasher is included in this recall. The units were sold by department and appliance stores and by homebuilders nationwide from July 1997 through June 2001 for between $370 and $800. Consumers should immediately stop using these dishwashers, disconnect the electric supply by shutting off the fuse or circuit breaker controlling it and inform all users of the dishwasher about the risk of fire. Contact Maytag for either a free in-home repair, or a $75 cash back reimbursement following the purchase of a new Maytag, Jenn-Air, Whirlpool or KitchenAid dishwasher. Consumers should not return the dishwasher to the retailer where it was purchased, as retailers are not prepared to take units back. February 1, 2006 Maytag is recalling about 2.3 million Maytag and Jenn-Air brand dishwashers because of a fire hazard. The Maytag repairman will be lonely no more. By an overwhelming vote, Maytag shareholders have approved a proposal to join forces with rival appliance maker Whirlpool. Maytag said the proposal was ratified on a yes vote by nearly 70 percent of the voting shareholders. The proposal only required the approval of 50 percent of the shares outstanding. The merger is currently under review by the Justice Department. In order to facilitate the review, Maytag and Whirlpool have agreed not to close on their deal until February 27, 2006, unless the department concurs before then. Both companies say they believe the deal will be ratified in the first quarter of the year. Maytag is a $4.8 billion home and commercial appliance company focused in North America and in targeted international markets. The companys primary brands are Maytag, Hoover, Jenn-Air, Amana, Dixie-Narco, and Jade. By joining forces with Maytag, Whirlpool will hold about 46 percent of the market for major appliances, well ahead of General Electric, which currently controls about a quarter of the market. The acquisition is likely to get a close review by the U.S. Justice Departments anti-trust regulators. Maytag is based in Newton, Iowa, with about 20,000 employees. Whirlpool has 68,000 employees, and produces kitchen and household appliances under the Whirlpool, KitchenAid, Roper and Admiral brand names. Consumers writing to ConsumerAffairs.com have consistently complained about some Maytag appliances, including dishwashers and washing machines. In April of this year Maytag settled a consumer class action suit alleging odor, mold and mildew problems with Maytag Neptune Washers. More than two million consumers were included in the class, and may receive repair reimbursements, replacement costs up to $500, and/or washing machine purchase certificates up to $1000. Whirlpool Corp. is recalling 1.7 million of its Maytag dishwashers because of a fire hazard, according to the U.S. Consumer Product Safety Commission (COSC). The recall also includes dishwashers sold under the Amana, Jenn-Air, Admiral, Magic Chef, Performa and Crosley brands. It's the largest dishwasher recall in three years. The CPSC says consumers should stop using the appliances immediately because a faulty heating element can short-circuit and ignite. Consumers have been complaining about the problem for years. "It began to have smoke pour from it with the stench of melting plastic," Chris, of Naples, Fla., told ConsumerAffairs.com. "Thank goodness it wasn't running at night while my family was asleep. I had to run out to the garage to the circuit breaker and trip it myself. Who knows what would have happened if I had not been there to prevent this electrical malfunction from spreading?" "I discovered our kitchen floor was wet and that water was coming in from under the counters next to my kitchen sink. Further investigation found that our dishwasher was the culprit," Dave, of Tracy, Calif., told ConsumerAffairs.com. "Inside the dishwasher were two holes in the plastic tub at the bottom of the washer. These holes appeared to be from burns which most likely came from the heating element." Maytag said it has received 12 reports of dishwasher heating element failures that resulted in fires and dishwasher damage, including one report of extensive kitchen damage from a fire. No injuries have been reported. Consumers should contact Maytag to verify if their dishwasher is included in the recall. If the dishwasher is included in the recall, the company said consumers can either schedule a free in-home repair or receive a rebate following the purchase of certain new Maytag brand stainless-steel tub dishwashers. The company is not offering to replace the dishwashers themselves. The rebate is $150 if the consumer purchases new dishwasher models MDB7759, MDB7609 or MDBH979; or $250 if the consumer purchases new dishwasher models MDB8959, MDB8859, MDB7809 or MDB7709. Consumers should not return the recalled dishwashers to the retailer where purchased as retailers are not prepared to take the units back, the company said. For additional information, contact Maytag at (800) 544-5513 anytime, or visit the firm's website. In 2005, at about the time Whirlpool purchased Maytag, Whirlpool recalled about 162,000 Whirlpool and Kenmore dishwashers. At the time, it said an electrical defect in the motor wiring posed a risk of the motor overheating and possibly catching fire. Whirlpool said it had received three reports of overheated wash motors but no reports of personal injury or property damage. The products recalled in 2005 included Whirlpool brand and Kenmore brand (made by Whirlpool Corporation) under-the-counter, plastic tall tub dishwashers. June 3, 2010 Whirlpool Corp. is recalling 1.7 million of its Maytag dishwashers because of a fire hazard, according to the U.S. Consumer Product Safety Commission (COSC).